I am going on a month-long outsourcing to Brazil and I am looking for a good war game with high replay value that will fit in my (fairly small) luggage. I got myself Folio series: Wilsons Creek and am decently pleased with that, but I want something better/cooler. I can fit a small box in my luggage no problem, but I cant fit Memoir 44 or War in the Pacific. Do you have any suggestion for me? Preferably something that I can actually buy in stores today. Try the "20" series, such as Waterloo 20. Low counter density, easy to pack flat in ziplock bags, and enough variety in the series to keep you interested for a while. You can see the reviews here on BGG. Check out the games from Revolution Games (II). I agree -- go to the Revolution Games website and scroll through their games. Wide variety, from WW2 to naval to ACW to medieval and more. Most are in ziplock, though some come in small boxes. Good quality, fun games, wide variety, and decent prices. Patton's Vanguard. This is an area game, if you like that (whereas Celles is hex-and-counter). Gazala: The Cauldron. Same system as Celles, but in North Africa instead of Western Europe (if you would prefer that theater). All of these can be fit into a large envelope. I don't know if they come with dice; make sure you take a pair with you. House of Normandy has four scenarios and Battles on the Ice has two. They're both fun games and don't take up much space. They also come in actually boxes, so they hold up better for travel than ziplock packaged games. Seven Pines; or, Fair Oaks also meets those criteria and has three scenarios. Aside from the ziplock issue, I'd also recommend a lot of Revolution Games products. Band of Brothers: Screaming Eagles is a good game and doesn't have a huge footprint on the table or for transporting. The 2nd edition box is bigger than the 1st edition but I'd probably not bring it in the box anyway. Both are easy to learn, can be put in a zip lock and are very enjoyable (be warned though, the Lock n Load tactical game will get you buying the rest of the series it is that good IMHO). For solo with short play intervals and replayability, the Victory Point Games States of Siege Series . Old editions were ziplock only, newer are in small box. This is a really good tiny game. I've played it 4 or 5 times. It also solo's really well. I agree Celles and Gazala are also really fun with Celles being the slightly easier/lighter game. Both solo very well. My suggestion would be, as long as you have a modern electronical device like a pad, access to a printer, access to internet to download something print and play. Lou Coatney has some very good games for free, their assembly is mostly done in an hour or two and when you leave the country, you can can simply discard it or give it away to somebody you might have gotten interested in wargaming . For tactical I would also recommend Valor & Victory, another p-n-p game. He also has a starter kit out, so playing can start quickly. Inexpensive way when you intend to travel light, don´t want to invest money and need something to do. Eagles: Waterloo, especially the 58 cards of the Quatre Bras game, [no need for Howitzer Fire as it can't be used]. There's a good set on Geek for $10, put it in deck protectors. There's my card list in the file section. I'd recommend the advanced rule suggestions. This is a small, but desperate encounter. Nice graphics. Takes up next to no space. Two-player as the Allied defender must bluff with face-down cards. For a solo game, maybe Mrs Thatcher's War: The Falklands, 1982. Definitely relevant, as rugby-playing Brazilian subalterns were not infrequently seconded to the Argentine Marines. You may want to look at some of the Minis or Folios from Decision Games. They usually have fewer counters and are in ziplocks so they don't take up a lot of space. By "relevant" (intentionally unclear formulated ) I mean games that are really war games, not stuff like Pocket Battle or similar. Why limit your yourself to stores ? Have a look at the Geekmarket. What I also found to be working regularly is to contact a fellow geek who rated a game really low asking if he would consider selling it. Geeks are strange folks though... I should know, im one of them! More seriously, apart from just being easier to buy things, its always more fun if the game is in print and available. Then its easy for me to convince a friend to puchase it or an expansion etc. With games from 2008 or 1987 its not that easy. I have to put in another nod for the ones from Revolution Games and will add one of my personal favorites: Operation Battleaxe. I also really enjoy Last Battle: Ie Shima. Recently started playing around with Paul Koenig's Market Garden: Arnhem Bridge and for a light wargame, it is quite enjoyable. Have played it a few times and each time was able to employ a different strategy which to me, shows it has some replay value. All of these have pretty low counter density, under 90 minute play times and come in zips. Excellent suggestions! I bought both Ie Shima and Operation battleaxe right away. Big thanks. Not sure how much you want solo play, solitaire (AI) play or to rope others in and if so what their wargaming experience would be. I really like how Hollandspiele makes lots of its games available as PNP on Wargamevault. Aside from the very affordable prices you also are going to get something pretty light and transportable if you want. How about Table Battles ( I have only played one of them but for 8 battles its just 50 odd cards and a few dice and cubes. It is also pretty entry level so easy to get others to play as its only 1 step up from Yahtzee but not without interesting choices. 2 Player but no hidden info so easy to solo. There are also some solitaire designs they have done - I enjoyed dipping into Charlamaine (sp). 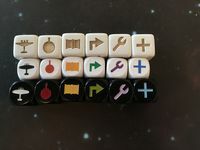 Just FYI, if you want to get anything from Hollandspiele, Revolution Games, or Tiny Battle Publishing, you have to buy directly from their websites. Hollandspiele and Tiny Battle both offer print-and-play downloads through Wargame Vault. Actually Revolution Games are available from quite a few places besides our website. In Europe we have a good dozen distributors and shops that carry our games. Canada Le Valet. In US Noble Knight or Fine Games. But we love folks who buy from our website.